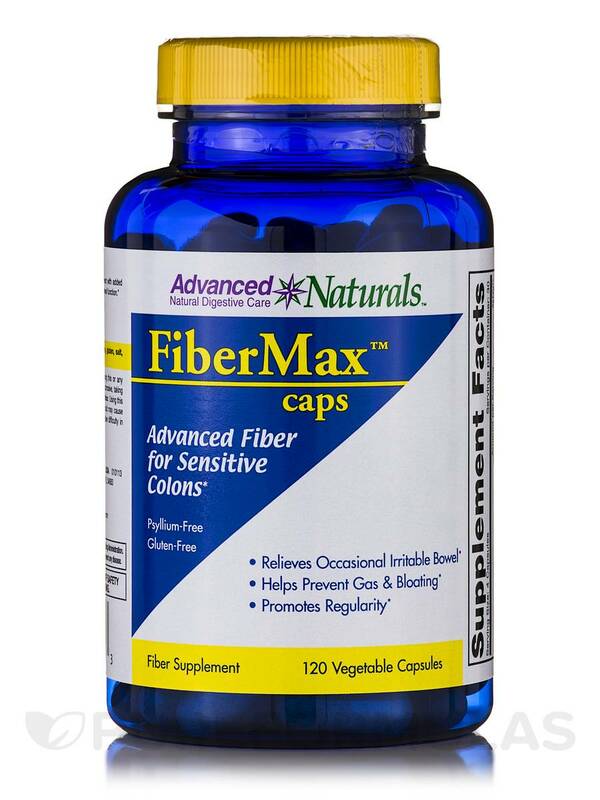 I have only been taking FiberMax Caps by Advanced Naturals for a short time but I'm not as constipated so thats good. Did not get the results I expected. 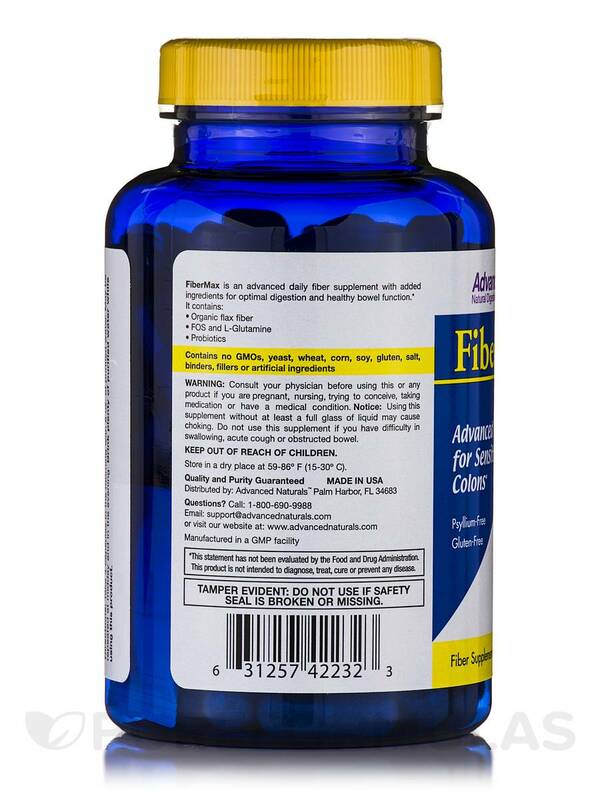 FiberMax Caps 120 Vegetable Capsules from Advanced Naturals™ provides your body with a natural source of essential dietary fibers. It may help relieve occasional irritable bowel‚ prevent bloating and gas. It may also help in promoting regularity. While it is necessary to consume a daily quota of 20-30 gms of fiber daily‚ our modern day lifestyle may prevent us from doing so. Unless our diet contains fruits‚ vegetables‚ nuts and seeds our fiber requirement may not be met. Many people feel that fibers slow down the body’s carbohydrate breakdown as well as sugar absorption. Fibers regulate blood sugar levels in our body and may help maintain the health of the gall bladder and kidney. 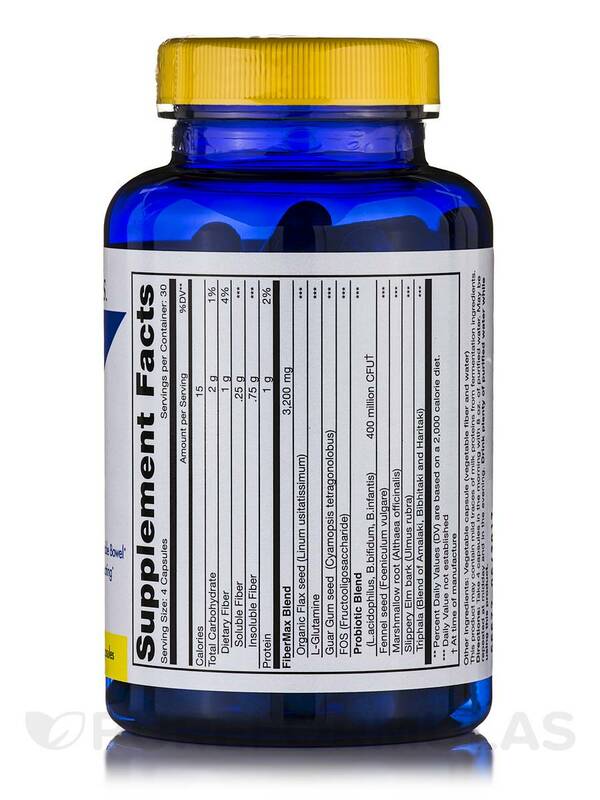 This supplement contains L-glutamine‚ an amino acid to nourish the digestive tract. It is added with active probiotics and FOS with every serving to maintain a healthy bacterial balance in the body. 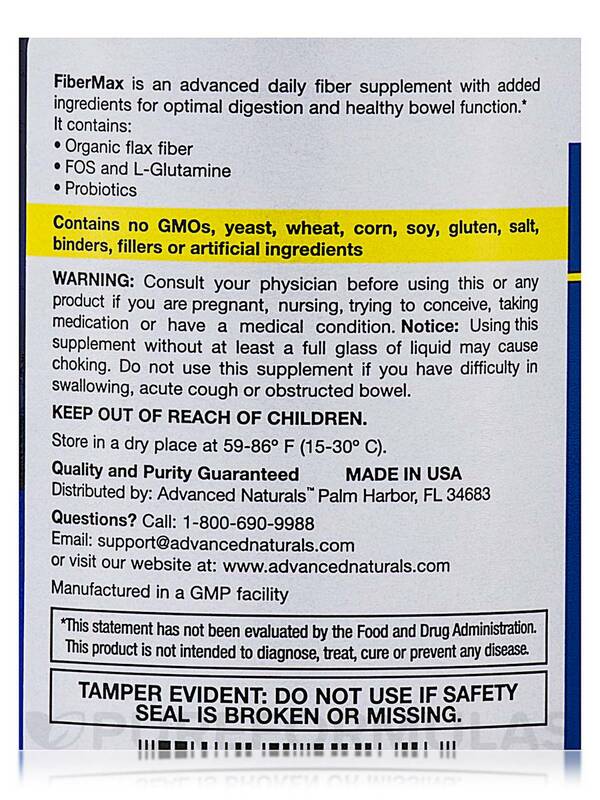 This Advanced Naturals™ supplement contains flaxseed and Guar Gum seed. While flaxseed may prevent other conditions in the body‚ it may primarily provide our body with fibers both of the soluble and the insoluble types. Other herbs present in this Advanced Naturals™ supplement are fennel seeds (that help with digestion)‚ marshmallow root‚ slippery elm bark‚ and Triphala. All of these work as a laxative and helps in providing advanced fiber support to the body. Give your body the advantage of FiberMax Caps 120 Vegetable Capsules from Advanced Naturals™. 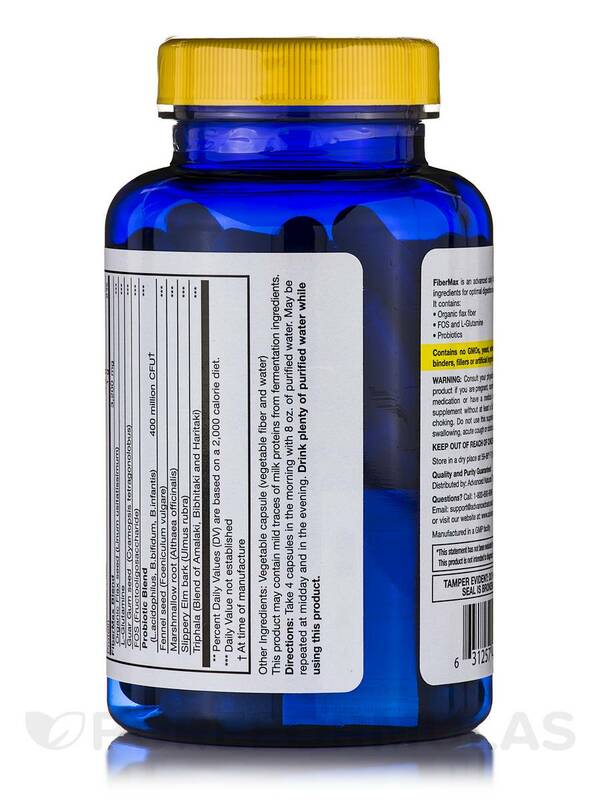 Take 4 capsules in the morning with 8 ounces of purified water. May be repeated at midday and in the evening. Drink plenty of purified water while using this product. 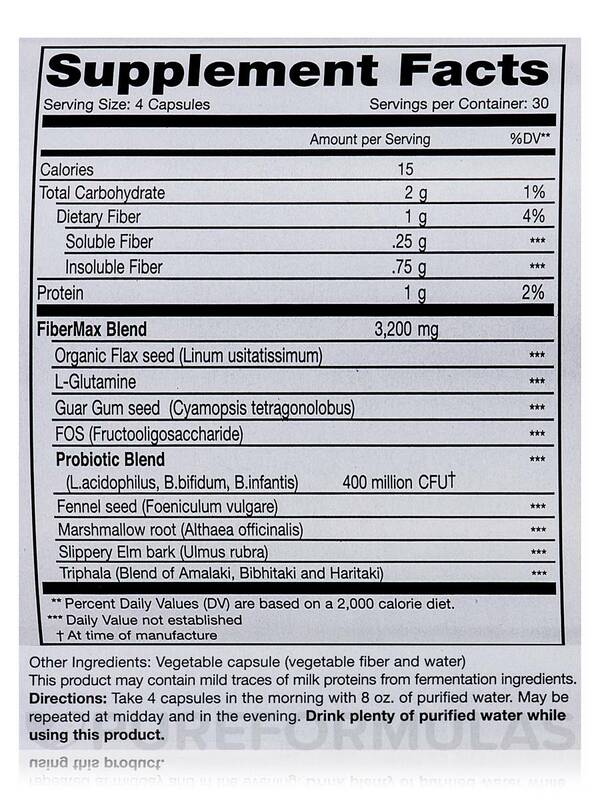 Notice: This fiber blend should be consumed with a full glass of purified water or juice. Consuming this product without enough liquid may cause choking. Do not consume this fiber supplement if you have difficulty swallowing. FiberMax Caps by Advanced Naturals is wonderful. I have had a problem with my colon and stomach. FiberMax is the only product that doesn't cause pain or bloating. I highly recommend FiberMax to everyone. My daughter is now starting it to regulate her constipation. No stomach pain or bloating. Small pills no after taste. I can hardly eat anything due to constipation. FiberMax Caps is the only Fiber supplement for someone who cant eat ANY grains dairy soy or eggs. Constipation got worse for me when I started taking it. But when I remembered I needed to drink more water it worked beautifully. Man gulping water makes everything better. I have more energy and better skin too.